We're delighted to add the super Drive Devilbiss Blue CPAP Standardplus and APAP AutoPlus Machines to our stocklist. These are the new models to the previous popular SleepCube range used by many NHS clinics (known as IntelliPAP in the USA). However, even the fixed StandardPlus CPAP Machine does display advanced data, such as AHI to check the therapy is working well. 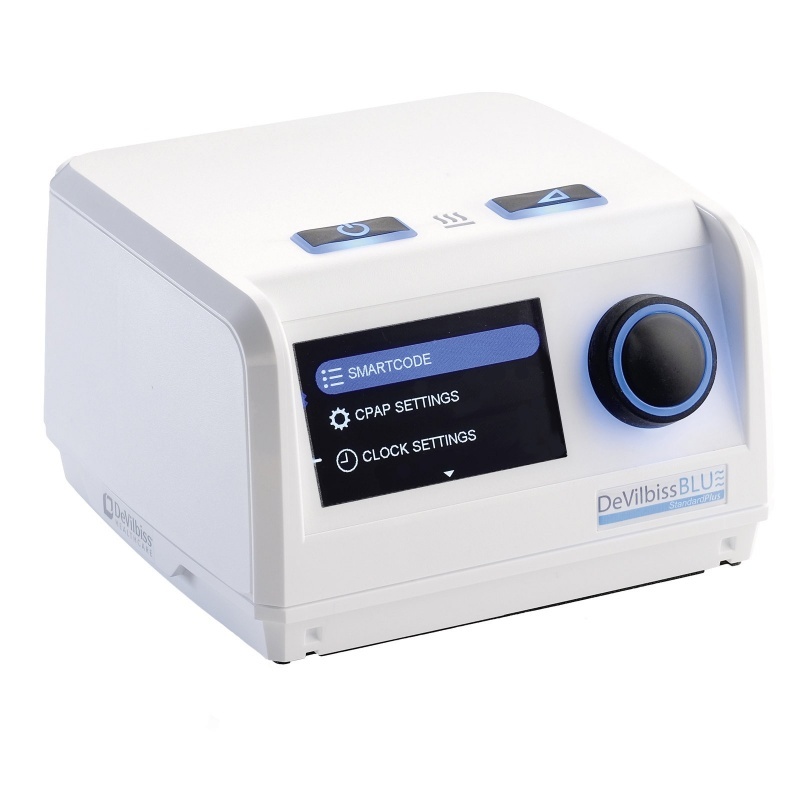 These are the newest 'Blue' models from Drive DeVilbiss - the fixed pressure CPAP StandardPlus Machine and the APAP AutoPlus Machine for those who prefer auto pressures. (These machines are called IntelliPap 2 in the USA). Both machines provide efficacy data, which is popular amongst patients who like to know how well they are doing with their therapy, and in particular they like to see that their AHI (Apnoea Hypopnoea Index) has come down to good levels compared to their original diagnosis. These are nice sized machines, and particularly good for people who don't have a lot of room on their bedside table as when the optional humidifier is attached this is fitted underneath the machine, so takes no extra room if space is limited. As you can see on the above image, next to the large LCD screen, the rotating button gives access to the different menus and settings, and when in stand-by mode displays the clock which also has an alarm. The AHI results can be viewed on the screen, along with usage etc. There is even the option to view more detailed results from the smartcodes displayed on the screen without needing to download any software by going to this website www.devilbisssmartcode.com and inputting the preferred smartcode, ie 1 day, 7 days or 30 days etc. SmartFlex is also a nice feature, as when activated it makes it easier to exhale against the pressure by slightly lowering the pressure for exhalation. There are lots of other features like ramp, auto start and stop to save having to press the on/off button, different tube settings etc. You can download the manual to see more at the bottom of this page. From concept to completion we took a fresh look at how a CPAP platform could help patients across the globe obtain the best possible night’s sleep. Our DeVilbiss Blue series utilises the latest advancements in sleep technology to offer great performance, maximum comfort and the ability to optimally monitor patient therapy. Deep Blue – A powerful new algorithm for detecting and responding to events. The algorithm in the DeVilbiss Blue sets a new standard of data and performance. Improved sensitivity to a full spectrum of respiratory events means it detects more data and responds to a new level of accuracy, giving the user the most comfortable experience. Its powerful logic allows the DeVilbiss Blue to differentiate and report simple Obstructive Apnoea from more complex scenarios, including Central Apnoea and mixed disease. Hypopnoea, obstructive apnoea, snoring, expiratory puffs, leaks, flow limitations, RERAs, central apnoea, periodic breathing are all now detected and reported with DeVilbiss Blue. True Blue – Unrivalled performance from an accurate, stable yet incredibly quiet motor. At the heart of a CPAP is its blower motor. An off-the-shelf motor would just not do. To meet the demanding requirements of DeVilbiss Blue, our engineers started from the ground up designing our own custom motor capable of delivering strong, stable and accurate pressures. Clear Blue – Easy to set-up, easy to use. Our large colour screen and intuitive control wheel, makes setting up and using DeVilbiss Blue incredibly simple. Graphical displays of functions like SmartFlex and FlowRounding become easy to interpret and adjust. Maintenance Free - Apart from regular cleaning of the filter, we developed the DeVilbiss Blue to be maintenance free for its lifetime. 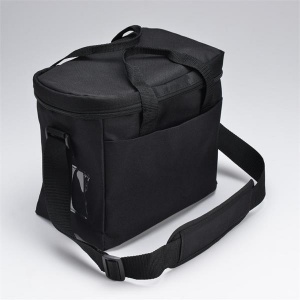 Cool Blue – Maximum comfort, no rain-out which is an Optional Comfort Accessory for those requiring humidification (see separate listings for more details). Dimensions are 9.4 cm (3.7 inches) long x 15.5 cm (6.1 inches) wide x 15 cm (5.9 inches) high. There is the choice of a standard humidifier or the new PulseDose technology version developed by DeVilbiss which delivers humidification on inhalation only. Both humidifiers attach to the bottom of the CPAP machines, reducing the need for extra bedside table space. 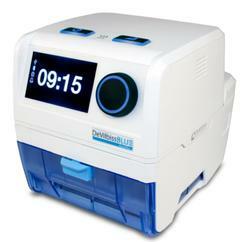 They can be purchased and more information viewed on this link DeVilbiss Blue Humidifiers. **It is our recommendation that when purchasing your own machine, if possible to go for the Blue AutoPlus version, as this can still be run on fixed CPAP pressure if preferred, but the StandardPlus fixed pressure CPAP cannot run on auto pressures. Patient Instruction Manual - download by clicking on this link.